What you have missed is that the Allston residents are taxpayers in Boston and you and Harvard are not. Harvard must have it's IMP application approved by a city agency which is the Mayor who answers to constituents. Telling residents that they are effectively wrong either in reasoning or taste is not a good position to begin the negotiation. Use your words carefully or you will cause the University more cost in the long run. Tentative accord by teachers, schools - The Boston Globe: "After more than a year of tense negotiations and a threatened one-day strike, Boston teachers and the school system last night reached a tentative contract agreement that would boost teachers' pay and require they contribute more to blunt the rising price of health insurance." The Harvard Crimson tells Allston residents that our "fears are unfounded" regarding Harvard's proposed Art Building. Let them know is you agree or disagree with a letter to the editor. ...But all of that is moot for Brighton contractor Carl McManus, 33, who is now sporting an ugly black eye and seven stitches in his skull after he said he was beaten by a bouncer at The Draft in Allston. Now police plan to seek complaints against the bar’s owner at Brighton District Court. “Following this incident the detective investigating the case sought a list of employees at the establishment. The owner was uncooperative,” said BPD spokeswoman Elaine Driscoll. This op-ed story about the enormous Atlantic Yards development in Brooklyn and local activity by concerned and caring residents brings to mind our efforts here in Allston and Brighton. The next meeting of the Harvard Allston Task Force is Wednesday, Feb 28 at 6:30 at the St. Anthony's School, 57 Holton St, Allston. Court documents: student stabbed in BC dorm over bleached laundry - Local News Updates - The Boston Globe: "The stabbing of a 19-year-old student in a Boston College dormitory this weekend was sparked by a fight between two women over whether one had bleached the other's laundry, according to documents filed today in Brighton District Court. " Helen Molesworth, Harvard's Curator of Contemporary Art, came to Harvard from the Wexner Center for the Arts in Columbus, Ohio. The Wexner Center has great public programs such as TeenArs Fusion Workhops, an art camp for children ages 14-18, and Summer Youth Workshops for kids ages 4-13. It would be great to see Harvard's proposed art facilities in Allston includes space and staff for programs like these. The Wexner also has a rich variety of public programs for adults, schools, and teachers. The Harvard Crimson :: News :: Bill Targets Campus Growth: "
Earlier this month, Boston City Councillor-at-large Felix Arroyo introduced a law that would require city council approval before a university could purchase new land in Boston. The ordinance makes council approval contingent upon the universities making payments equalling or exceeding the value of the property taxes the city would lose due to ownership by a non-profit organization. Arroyo said he thinks that redistributing some planning powers from the BRA to the council will give Bostonians a more active role in universities’ expansion processes. Arroyo added that he hopes the moratorium will force universities to detail their impact on the city more thoroughly. Universities “should come to the city and present the plans of where they are going to grow, what affect they’re going to have, and how that will be compensated with he loss of the tax base,” he said. Mellone added that not all Allston residents view Harvard’s expansion in a negative light. Deputy Press Secretary for the BRA Jess Shumaker said that her organization has already spent years coordinating Boston’s vision for the area with Harvard. “It’s more important to remember that we have a huge amount of planning already invested into this process,” she said referring to the four years that the University, along with the BRA and residents, put into the North Allston Neighborhood Strategic Plan. The Harvard University Art Museums announced Friday that Senior Fellow of the Harvard Corporation James R. Houghton ’58 and wife Maisie K. Houghton ’62 have endowed the contemporary art curatorship currently held by Helen Molesworth. Molesworth was tapped by the University last year to serve as the first full curator for contemporary art at the Art Museums. She began her duties earlier this month. In February 2006, the Art Museums released a plan to reinvent their renowned collection with an eye toward the expansion in Allston. Molesworth said that the proposed Allston-Brighton Art Center would provide additional space for works of modern and contemporary art, which are often larger than pieces from other genres and which the Fogg Museum cannot accommodate. Hearings are in room 801 of City Hall at 11:30. For more info call 617-635-4775. Upgraded digs, peace of mind for seniors at Leventhal House - The Boston Globe: "Thanks to a low-interest-rate bond, the 350 senior citizens who live at Leventhal House in Brighton will soon have homes that are not only more comfortable , but that will continue to be affordable for decades to come." "There's a new museum in town -- all about Allston and Brighton. If you thought local history began and ended with the Freedom Trail, you're in for surprises at the Brighton-Allston Heritage Museum , whose opening this weekend was timed to coincide with the 200th anniversary of Brighton's split from Cambridge"
The Boston Cannons will play 6 regular season games in Allston between May and August. Games start at 7 or 7:30. Tickets cost between $10-15. Last year's home game attendance was in the 4,000 to 6,000 range. Along with expanded seating and hospitality options, the Cannons will utilize Harvard Stadium’s surrounding fields for tournaments and other lacrosse related events on Cannons game days. Major League Lacrosse’s Boston Cannons have inked a deal to play their 2007 home games at Harvard Stadium in Allston. The 104-year-old stadium, which was recently lined with FieldTurf and given permanent lights, has not hosted a team from the pros since the NFL’s Boston Patriots played there in 1970. If not for the recent upgrades, the drought probably would have continued, Director of Athletic Communications Charles V. Sullivan said. Chandler wouldn’t disclose the specifics of the deal, but the Cannons are essentially renting the stadium from Harvard for the summer, according to Sullivan. For each one of the team’s six home games, the organization is offering a 20 percent discount for all Harvard students and faculty, Chandler said. Arboretum neighbors: 100-year plan ‘no compromise’ - The Bulletin Newspapers, Inc.
Update on Harvard's plans to clear trees from a wooded hill in Roslindale to build a road and 40,000 sq ft botanical research facility. Strange that Harvard, with so much land in Allston and Brighton sitting vacant, thinks that a tree-covered hill in Roslindale is where this building needs to be built. Is Harvard University’s proposal to build an art center at 224 Western Ave. a good idea or not? Is Barry’s Corner the right location? It is truly publicly accessible? Does it bring enough community benefits to the neighborhood? As evidenced in hundreds of letters to the BRA and messages on community Internet boards, it is clear that residents are fairly united in their opposition to the museum project, on which the university is tentatively scheduled to break ground later this year. More tentative details of the Boston College master plan for development in Brighton are trickling out in advance of the approaching Institutional Master Plan filing, causing debate among residents over what is the best and most appropriate way for the university to grow to the satisfaction of both BC and the neighboring community. Over the next 10 years, the university hopes to add several structures to the expansive Brighton properties, including a new undergraduate housing structure, a conference facility next to the former cardinal’s residence, a 250-car partially underground parking structure, and new athletic facilities, including a baseball diamond with up to 2,000 seats. The Brighton-Allston Historical Society is premiering the museum, which is located in the lower level of the Senior Center, on Feb. 24 from 3-8 p.m. The opening is free, and will feature a catered reception as well as serve as the inaugural event for this year’s bicentennial celebration. "On Saturday afternoon, Jan. 27, anyone who drove or walked by the KFC on North Beacon Street caught a glimpse of a person in a chicken costume waving as they passed. “The animal costume is a friendly thing people respond to,” said Helen Rayshick, 55, the executive director of the Massachusetts Animal Rights Coalition. The chicken, along with 25 other people ranging from high school students to a Navy veteran to an attorney, participated in a protest in front of the Brighton KFC organized by the coalition." Allston-Civic Association: all current applicants deserve liquor licenses - Allston/Brighton TAB: "Allston-Civic Association: all current applicants deserve liquor licenses"
In the last two months, a record number of restaurants in Allston have moved to get liquor licenses, causing residents to struggle to figure out the most fair and equitable way to decide who should get them. The density of the existing Harvard Business School campus in Allston is quite low, with a floor to area ratio (FAR, or ratio of a building’s floor area to the size of the plot on which it is built) of about 1. The FAR of Harvard’s Cambridge campus is about 1.5. The proposed campus in Allston would have an FAR of about 2. Members of the Harvard Allston Task Force, a group of local community leaders, have already raised specific concerns about deviations from planning guidelines previously established by Harvard, local residents, and the city; among the issues they raised are the specifications for the initial science buildings, which exceed a height limit of 95 feet and seem to preclude a conventional street grid. At a community meeting, residents also raised concerns that the configuration of those buildings around green spaces serves to shut the community out, rather than to create the permeable campus-neighborhood boundaries envisioned in the joint planning process. Residents also focused on the relatively limited retail space planned for the key intersection of Western Avenue and North Harvard Street. from the Conservation and Recreation Campaign outlines the many ways that our system of public lands not only contribute to a healthy environment, but to our economy and quality of life. The goal of this information is to support better management of these treasures. Our parks and beaches are not only environmental assets, but economic ones as well. When we under fund our park system, not only are we hurting our environment, but we are hurting our economy. Residents of communities facing future expansion plans, developed by both universities and businesses, have criticized the Boston Redevelopment Authority for not showing enough interest in how the neighborhoods' residents will be affected by the plans, prompting area organizations to question the public's ability to check the BRA's power. "Three decades after a plan for two additional residential colleges at Yale University was scrapped because of costs and city officials hostile to the loss of taxable property, the university is about to revisit the issue. This time however, the potential site is already tax-exempt, the city has been kept abreast of the university’s thinking and an agreement has been reached on closing off stubs of streets that intersect the property to allow for development. Three city streets that dead end on the large parcel will also be turned over to the university in exchange for $10.25 million in public improvements along Prospect and Sachem streets, as well as completion of the Farmington Canal Greenway to the Audubon Arts District and an upgrade of Scantlebury Park. Under President Levin there has been a sea change in town-gown relations, with cooperation on attracting retail and biotech businesses to New Haven and an agreement to send a voluntary yearly payment to the city of $4.2 million. This is in addition to the $3.5 million it pays on commercial properties, while in 2006-07 alone, the $200 million in university construction brought $3 million in building fees to the city. As for future building, Levin said the university makes a point of keeping the city in the loop early in the process. "We have been in close consultation with the mayor and with city planners for years. I think everyone understands growing the university can be a big asset to the city. The question is where and how and in that we have always involved the city," Levin said. A NY Times Editorial about the country's crumbling infrastructure (roads, bridges, power grid, airports, levees, etc.) which is as relevant in Allston as anywhere. Herald columnist Alan Lupo makes a good suggestion that Governor Patrick could work with the many citizens across the State working hard to improve their communities. "You have set up a Public Liaison staff in your office. This is good. Its job is to connect with neighborhood folks, to keep them and you in the loop, to come up with ideas to make life better... Perhaps your good offices could ride herd on Harvard to be sensitive to Allston and Brighton as the university clones itself in those neighborhoods." Here is a link to the Governor’s Public Liaison Office website. We can contact them at 617-725-4005 or by using their online form. I will call them today and let you know how it goes. Hundreds cited for not clearing sidewalks of ice - The Boston GlobeSince last week's heartless Valentine's Day northeaster, the city has cited about 800 homeowners and businesses for not clearing sidewalks of ice. Officers will continue their crackdown on violators today. Harvard has proposed to build a 60 foot tall, 130,000 square foot building at 224 Western Ave in Allston. This site is between the Dunkin Donuts and the Harvard Business School's Teele Hall. It also abuts several two family homes on Franklin and North Harvard Street. Harvard's driving need to build this building is to allow Harvard to renovate the Fogg museum in Harvard Square. The Allston building would house the 200 staff who currently work at the Fogg for the several years that the Fogg would be under renovation. This building would also have storage space for Harvard art that is currently at the Fogg. On the third floor the design has three rooms where art would be on public display. A few very small rooms would have a variety of uses (cafe, gift shop, education). The community would love to have a museum here in Allston. In 2004, Harvard published an exciting report that identified different ways that Harvard could create a major cultural institution here. This report explained that the Peabody Museum of Archeology and Ethnology "lacks sufficient exhibition space to display the wealth of its collections" and less than 1/2 of 1% of its collection is presently exhibited. Regarding the Harvard University Art Museums, the report states that a lack of "exhibition space for modern and contemporary art is a threat to its mission." And finally, Harvard's reports tells us that the Harvard Museum of Natural History "is space-constrained in all elements of its activities—administrative, programmatic, collections and exhibitions—and in terms of public amenities. Current space is inadequate for many activities and is non-existent for others." So Harvard seems to be ready and willing to build museums of special significance. But as a facility for the general public, Harvard's proposal for Allston is very lacking. Only 10% of the building will be used for public display of art. Storage, administrative, and curatorial spaces will comprise the vast majority of the building. The cafe (20 x 30 feet), gift shop (20 x 25 feet), and public education room (22 x 22 feet) would be nice to have if they were enlarged to be big enough to support meaningful activity. In their current form it is hard to see them having much public value. If Harvard is going to build the proposed building, the community will be disappointed that Harvard is not willing to build a more public building with more art on display, but the biggest problem with the current proposal is that it puts the building in an inappropriate location. Our neighborhood plan, the North Allston Strategic Framework, was written jointly by Harvard, the City, and the Allston community. In this plan, Barry's Corner, the intersection of Western Ave and North Harvard St, is identified as being the location of 200,000 square feet of neighborhood-serving retail space. Barry's Corner should be a vibrant public hub. It is not the right place for this primarily private building. Harvard has plenty of land in Allston and a building like this should be an interior campus building. Harvard should not be putting private buildings in highly public locations. This is also the wrong place for a building with a roof garden and ground-level sculpture garden. Both of these could be great at the right location, but this position next to the neighboring homes is not right. Also, the proposed 60 foot height of this building violates the 35 foot limit established in our neighborhood plan. And Harvard's plan at this site has 140 fewer parking spaces than this building needs and Harvard has not presented a complete plan for where it will park these cars. Alternatively, Harvard could use a bigger site (and Harvard owns several sites that seem to have good potential) to build a much bigger museum. This larger building would be able meet Harvard's needs (storage, offices) and put much more of Harvard's collection on display. This is the building that the community hopes Harvard will build, and we will be particularly eager, if Harvard will consider this option, to work collaboratively with Harvard to find a location in Harvard's existing Allston real estate holdings where this could work. The Harvard-owned sites on Western Ave on either side of Smith Field shown below are two possibilities. So in summary, the biggest problem is WHERE Harvard wants to build this building. The site is too small and public for the private building that Harvard has proposed. The site is also much too small for a larger, more public museum. So how did Harvard end up selecting such a bad site for this building? In April 2006 Harvard proposed two projects: a 90,000 sq ft temporary art facility at 1360 and 1380 Soldiers Field Road (these buildings are on both Soldiers Field Rd and Western Ave - they are the Citizens Bank building and the Mahoney's site) and a renovation of the 25,000 sq ft warehouse at 224 Western Ave to create an interim arts and culture space. Last fall Harvard decided it didn't want to build the at the Citizen's Bank building site. The reasons for this have never been made public. Harvard also decided instead of a 90,000 sq ft temporary facility to build a 130,000 sq ft permanent facility. And Harvard decided to drop the interim arts and culture space planned for 224 Western Ave and use the 224 Western Ave location for the 130,000 sq ft building. Harvard has admitted that they never considered other possible locations, probably because they did not want to have to re-file paperwork with the City to use a new site which would delay the project by a few months. So in a rush to build, Harvard is trying to build a cramped, private building in a site where it just doesn't belong. b0st0n: Why does Allston-Brighton keep re-electing Jerry McDermott? The best number I know to call is the Mayor's 24 Hour Hotline - (617) 635-4500. You can also fill out the form at www.cityofboston.gov/mayor/24/. Harvard University calls it an art center. North Allston residents call it a glorified warehouse. The ongoing debate over Harvard's plans for expansion into the North Allston neighborhood turned into a battle of rhetoric Monday night as the university presented its preliminary proposal for a 130,000-square-foot art facility at 224 Western Ave.
How much public life would Harvard Athletics bring to Barry's Corner? Harvard, in its 50 year plan, describes Barry's Corner as "urban, active, and when all the facilities are completed on its corners, a bustling scene." How does Harvard plan to achieve this? With "new athletic facilities for fitness, hockey, basketball, swimming, and rooftop tennis courts." These facilities include the relocated pool, hockey rink, and basketball courts that would need to be relocated to make room for undergraduate dormitories along the river. So it is worth looking at how these athletic facilities, which are only open to the public as spectators at Harvard athletic events, could really create an active and bustling scence. Here are the Harvard athletic events open to the public held at those facilities during the 2006-2007 season. Approximate # of people per event: 1000. The people who attend these events are not people going from store to store, or walking along Western Ave animating the street. These are people sitting inside for a couple hours at an indoor event. Most of these events start at 7 p.m. and end after 8 or 9 o'clock. How many of those people will leave the event and immediately leave the Barry's Corner area (to walk back to Harvard Sq, drive home to the suburbs, etc.)? How many will walk along Western Ave, go to the shops there, and be part of making it a lively urban scene? WHDH-TV - New England News - Gambling found in Allston basement: "Authorities investigating a sewage backup at an Cambridge Street restaurant discover an illegal gaming operation. " When is the right time for a university to be honest and open with the community? Maybe we can find the answer in this Harvard publication? When is the right time to be honest and open in the workplace? The answer is: always. In 'The Danger of Silencing Conflict at Work' (Faculty Lecture on CD-ROM), HBS Professor Leslie A. Perlow uses three studies to show that silencing conflict can have devastating negative task and relationship consequences. Her research shows that the best way to complete a task on time and maintain positive working relationships is to communicate openly and honestly. We were off to a great start yesterday! Click here to visit AllstonBrighton2006 and read the several new posting yesterday about Harvard and Allston. In case you haven’t already, I hope that you will email Gerald Autler at the BRA (click here to email) before Friday about Harvard’s Art Building proposal. We need lots of people to speak up, so please ask your family and friends to write too. The email can be short and to the point. The BRA should not approve a Harvard Institutional Master Plan Amendment to create an art building at 224 Western Ave. That is the wrong location for a 130,000 square foot building. Harvard owns a lot of other land in Allston where it could build a wonderful big museum. The community will be happy to work with Harvard and the City to find the right location and design the right building. But 224 Western Ave is not the right location and Harvard’s development in Allston is too important to allow such an obvious mistake to be made. Join your neighbors for an enjoyable evening of ice skating on Wednesday, March 7, 2007 from 7:30 p.m. until 9:00 p.m. This year's event will take place at the Bright Hockey Center, located between the Gordon Indoor Track and the Palmer Dixon Tennis Courts at the Harvard Athletics area along North Harvard Street.Enjoy complimentary refreshments and ice skate with your family and friends. For additional information, please call Kevin McCluskey's staff at (617) 495-4955 or e-mail jim_barrows@harvard.edu. Letter to the Editor I wrote published in The Crimson. If the Pike has a million dollars to build a U-turn ramp in Allston for the convenience of travel from the Back Bay to South Boston, I certainly hope the Pike also has the money for the Lincoln Street sound barrier. A good overview of the increasing community involvement in the neighborhood. "Resident Bruce Boccardy sees the increased activism as a way for residents to try to match the perceived strength of Harvard. “A united front is important for the neighborhood,” he said. “I don’t believe in fighting for the sake of fighting, but you don’t go to a gunfight with a knife,” he said. “Harvard has a lot of power, and we have to match that in any way we can. “We’re not trying to evict Harvard,” he added. “That’s not possible. We just want them to scale it back, to integrate the university better with community.”"
In response to Boston-area universities' plans to expand their campuses into local neighborhoods, city councilors are considering a proposal that would tax new university buildings in the future. In response to Boston-area universities' plans to expand their campuses into local neighborhoods, city councilors are considering a proposal that would tax new university buildings in the future. Universities, which are currently exempt from taxes on the construction of new buildings, would have to pay for any future expansion projects under terms of the proposal introduced by Councilor-at-Large Felix Arroyo during yesterday's meeting at City Hall. The proposal comes as Harvard University finalizes the details for the first 20 years of a 50-year plan that would expand its main campus across the Charles River into Allston, where residents have expressed concerns that Harvard's expansion will negatively change the community. Councilor Jerry McDermott (Allston, Brighton) said Allston residents have been frustrated by the university's upcoming expansion. He did not, however, support Arroyo's proposal. Q. Harvard is building a new campus in Allston. Are you using in-house counsel or outside lawyers for advice on that? A. Both. We have a lawyer whom we recruited from Goulston & Storrs, Daniel Rabinovitz, and Dan was hired specifically to provide legal guidance on the Allston project. But given the scope of the Allston project, it is also the case we will be using outside counsel to provide a great deal of assistance. Goulston & Storrs is going to be one of the firms doing a lot of work, and that occurred through a rigorous RFP [request for proposals] process. 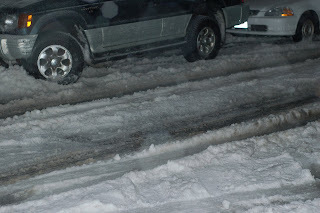 8:00 last night, hours after the snow had stopped, and cars can barely make it up the very slight slope of Mansfield Street. No sign of a plow or salt or sand on the street recently enough to do much good. What are the roads like where you are? Ideally, the museum will do two things: fulfill the university's academic mission and also serve the public, offering programs and access that delight, educate, and inspire. One person mocked Harvard's approach to development at a community meeting Monday night, saying: "We'll let you know what's happening when the building is built." In the meeting, residents repeated a common theme: the proposed museum is too small and it's in the wrong place. In a meeting with town residents Monday night, Harvard officials fielded questions about the center to be built on Barry's Corner - a keystone project of the university's 20-year "Institutional Master Plan" to move across the Charles River to an Allston neighborhood where several athletic facilities and administrative buildings already exist. Allston residents have voiced concern about Harvard's encroachment upon already-developed land. "I signed on to this deal to become partners with Harvard," said Allston resident Tim McHale at Monday's meeting. "Now, I'm beginning to doubt that partnership." McHale said his excitement about the benefits the Art Center could bring to Allston was diminished by Harvard's unilateral decision-making. "It is time Harvard reestablished its relationship with this community and reasserted itself as a partner rather than a single-minded entity," he said. City councilors led by Chuck Turner spent 48 minutes yesterday debating a symbolic measure calling for the withdrawal of troops from Iraq as Boston neighborhoods face deadly violence exploding outside their homes daily. Other councilors, including Sal LaMattina, Stephen Murphy and Jerry McDermott, argued they are paid $87,500 a year by their constituents to discuss Boston issues, not foreign policy. McDermott, who represents the Allston/Brighton area, added that if the war in Iraq is open to discussion on the City Council floor, so should “securing our borders” and skyrocketing prison costs. Where is the "planning" in Harvard Planning? The most outrageous problem with Harvard’s proposal for a building at 224 Western Ave in Allston is that Harvard planners actually admit they never considered nearby Harvard-owns sites as possible locations for this building. The 224 Western Ave location has many problems, including a narrow and irregular shape and proximity to several abutting residential properties. But Harvard, in a rush to start construction, wants to build at 224 Western Ave because to use a different site Harvard would first have to submit a modified Master Plan Amendment to the City of Boston, and this would delay the project by several weeks or months. We know Harvard has lots of money, but before spending hundreds of millions of dollars on a new building doesn’t Harvard review all possible locations and choose the best one? Hope has two children: anger and courage. Anger at the way things are in the world, and the courage to change it. "Three weeks later, as the April crisis hit Harvard, a widespread debate over University-community relations finally occurred. Through "University expansion," as it came to be called, was much less discussed than ROTC, and much of the discussion of community issues was confused and rhetoric laden, it nevertheless was the first time in memory, and probably in the history of the University, that any substantial number of people had stopped to give any thought whatsoever to the relationship between Harvard and the communities which surround her." "The last year has seen a change in University attitudes toward the surrounding communities--a switch from an aloof posture to be emphasizing an active involvement to aid Cambridge and Boston. But the change is not necessarily definitive; it could be reversed if the problems created by the new position seem to be greater than those arising in the past. Only time will tell if the various segments, of the University-including the Corporation, faculty, and students alike--will retain their new-found enthusiasm for aiding the community." After 13 months of negotiations, Boston teachers appear ready to hold a one-day strike on Thursday for the first time in 14 years, forcing city and school officials to draw up contingency plans for the system's roughly 58,000 students with no school to attend. The real voyage of discovery consists not in seeking new landscapes…But in having new eyes…. Brighton Main Streets invites you to attend our Brighton Commercial Corridor Project Charette on Saturday, March 3, 2007 from 8:30 am to 1:00pm at St. Elizabeth’s Medical Center ~ Seton Auditorium. Hearings are at 11:30 on Tuesday, February 27. Please feel free to call the Board of Appeal at 617-635-4775 if there is a question or concern you might have regarding this matter. Last week Harvard responded to 3 letters that have been submitted by the Harvard Allston Task Force. Here is Harvard's response and the Task Force letters are posted here. What Harvard does in this next decade will serve as an important part of the answer to these contradictions and challenges. What we do will determine not only whether Harvard retains its preeminence. It will help to define the character and meaning of universities for the 21st century - whether they can be supple enough, enterprising enough, ambitious enough to accomplish all that is expected of them..."
"She pointed to Harvard's plans to build a new campus in Allston. Now Faust must turn what has been a rocky courtship into a happy marriage. Early sketches show a campus that could be Parisian in its elegance. But it should also fit in with the scale and soul of Allston." Harvard Prof To Design City? The Harvard Crimson :: News :: Harvard Prof To Design City? "Recent media speculation surrounding Professor in Practice of Urban Design Alex Krieger’s placement on a long list of candidates to lead the Boston Redevelopment Authority (BRA) has people on both sides of the river concerned about the University’s role in Allston development..."
"Harvard urban planning guru Alex Krieger has long been one of City Hall’s favorite architects. Now Krieger is being talked about by insiders as a top candidate to head the city’s most powerful agency, the Boston Redevelopment Authority. " Will Harvard's new president confront the truth about Harvard's community relations? Colleagues say Faust is driven to confront the truth - The Boston Globe: "Faust, an award-winning historian expected to be named Harvard's president today, reveals much about herself and her work habits in a three-decade career as a scholar of the American south. Her goal, she has said in interviews, is not simply to tell the stories of the neglected. Instead, colleagues say, Faust wants to confront the truth -- even when it is ugly." Another example of institutional expansion in Boston and what a neighborhood is doing about it. The Arnold Arboretum of Harvard University has proposed building a 45,000-square-foot institutional facility on land it owns near the Roslindale Wetlands.A public meeting about the proposal is scheduled for Wednesday, January 31, 6:30 p.m., at St. Nectarios Greek Orthodox Church in Roslindale Square. All concerned about this project or interested in learning more are encouraged to attend. The most prominent concern voiced by neighbors to date was the lack of permanent preservation of green space at the site. The Boston Redevelopment Authority has already received a heavy volume of comments about the proposal—proof that comments from the public are noticed and DO make a difference. "NORTH ALLSTON/NORTH BRIGHTON is a thriving Boston neighborhood bounded by the Mass. Pike and the Charles River, a place where new families settle and long time homeowners maintain tidy yards. Home to 10,000 people of many cultures, this neighborhood stands poised between imminent danger and unprecedented opportunity. For in the past decade, Harvard University has bought hundreds of acres of our neighborhood, and later this year Harvard hopes to start construction of its massive new Allston campus--more than 4 million square feet of new development to be built in the next 20 years..."
"Drew Gilpin Faust, a Civil War scholar, will tackle a “reconstruction” of her own as the new president of Harvard—bringing the University back together after the tumultuous tenure of Lawrence H. Summers." Also, there was significant discussion about the advantages for Cambridge as Harvard plans to move undergrads to Allston to make room for more grad student housing in Cambridge. Grad students certainly will do more for the local economy as opposed to undergrads whose experience is more insular to their colllege. Grad students are more likely to have children and to be part of the community. In Harvard's 50 year "plan" for Allston there are just a few new housing buildings proposed that would seem to be likely to contribute to the North Allston/North Brighton community. By the numbers, in the next 50 years Harvard proposes 1.2 million sq ft of undergrad dorms in Allston. That is more than 3 times the amount of grad student housing proposed for Allston (350,000 sq ft). The Globe picked up Jeff Bryan's recent letter about Harvard's proposal for an Art Warehouse on Western Ave.
George Thrush is director of the School of Architecture at Northeastern University. Here are a couple excerpts from his article about why 1 Western Ave is not so bad. Let’s face it. The graduate student dormitory at the Harvard along the Charles River, known as One Western Avenue, is an almost uniquely reviled building. Since its completion a few years ago, it has been pilloried by neighbors, activists, critics, and even architects. The building has no doubt failed to perform a key political act, namely securing a modern future for the new Harvard in Allston. And the building’s negative press has since fed on itself to the point that One Western Avenue is now seen as a serious cautionary (and very negative) example of how things might go wrong in the high stakes world of Harvard’s institutional planning for its expansion. The designs presented here in Abu Dhabi, the capital of the United Arab Emirates and one of the world’s top oil producers, are to be built on an island just off the coast and include three museums designed by the celebrity architects Frank Gehry, Jean Nouvel and Tadao Ando, as well as a sprawling, spaceshiplike performing arts center designed by Zaha Hadid. Mr. Gehry’s building is intended for an Adu Dhabi branch of the Guggenheim Museum featuring contemporary art and Mr. Nouvel’s for a classical museum, possibly an outpost of the Louvre Museum in Paris. Mr. Ando’s is to house a maritime museum reflecting the history of the Arabian gulf. The project also calls for a national museum and a biennial exhibition space composed of 19 pavilions designed by smaller names and snaking along a canal that cuts through the island. Art schools and an art college are also planned. “The City That Never Walks,” by Robert Sullivan (Op-Ed, Jan. 29), is right. 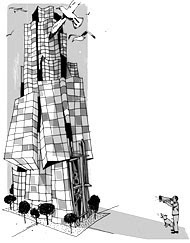 New York City must change its priorities and reapportion its precious public real estate, too much of which has been given over to the motor vehicle. New York City should simply convert approximately every 10th street to a green street, with widened sidewalks, bike paths and clean bus rapid transit lines. Other vehicles would be permitted to enter these green streets for a single block for loading and unloading only. This simple, elegant step would bring New York into the 21st century, and prepare it for a growing population with efficient and environmental transportation, while building on the city’s true and rich character as a pedestrian city. This story is a reminder of how fortunate we are to have the Honan Allston Library in our neighborhood. Across the city other residents look at our library as a model for what they would like to see where they live. This story in today's Globe discusses the future of Barry's Corner. The story does get into the details of the "art warehouse" that Harvard wants to build in Barry's Corner or how Harvard wants to move private athletic facilities (pool, hockey rink, basketball court) into Barry's Corner to make room for dormitories along the river. Harvard is not creating the ‘hub of activity’ at Barry's Corner in Allston that it would lead you to believe (“Harvard's Allston Expansion Plan Turning a Corner” - February 3). In fact, Harvard’s only planned Barry's Corner project would do just the opposite. This ‘art warehouse’ falls far short of the great public museum that Harvard could create and that Allston would welcome. Harvard has proposed a building that will mostly be used for office and storage space, and art would be displayed in less than 10% of the building. Barry’s Corner needs vibrant public buildings to become a world-class public space. But instead of ambitious projects to make the most of Allston’s wonderful potential, Harvard is creating a widening gulf between an attractive long-term vision and the disappointing reality of what Harvard plans to build. Is Harvard Really Doing It Right with Its Neighbors? Blog By Ed Kent: Harvard Does It Right with Its Neighbors! It is always interesting to see another perspective! Ed Kent write from New York after reading Harvard's press release about the wonderful community engagment that Harvard describes as happening in Allston. (I'm not sure I know anyone who lives in Allston who would describe it that way.) Ed also write about what is happening with Columbia University as it plans to expand into Manhattanville. Sounds so much worse that what is happening here in Allston and Brighton, as locals there fear taking of property by eminent domain. Allston eateries' snacks emit international flavor - The Boston Globe: "There is no food on the street here, but there's street food galore. Inside dozens of colorful storefronts, little snacks and sips and quick bites are offered from around the world." Allston restaurants mentioned include: Soul Fire Barbecue, Hanmaru, Infusions Tea Spa, Aneka Rasa, Color, Madina Market's Kitchen, Moscow International Food Store, and Camino Real. Last summer, Penn published a master plan for a 42 acre expansion of its campus in the next 25-30 years. The plan and an executive summary can be downloaded here. It will be interesting to compare this with Harvard's plan. How specific is it? Does it propose specific projects? (Harvard's plan does not.) What level of integration with the community and openness does it create?